Thanksgiving is often viewed as the gateway to the holiday season. Once Thanksgiving is done and over with, Christmas preparations are in full swing and it’s one big flurry of activity right up until New Year’s Day. As a result, Thanksgiving is also the gateway to anxiety as you think about all you need to plan for over the next month and a half. Perhaps it’s time to take a step back and view Thanksgiving as a gateway to something else. Thanksgiving is the opportunity to set the tone for the whole holiday season. After all, the true meaning behind Thanksgiving is being grateful for all that we have. Accordingly, this holiday should really be the gateway to being more mindful of all the blessings and opportunities in your life as the year comes to a close. Make it a theme for the holidays, starting with Thanksgiving. If you as a parent seem rushed, stressed and not particularly thankful, this message can inadvertently send the wrong message to your kids about the tone of the holidays. In contrast, if you lead by example, your kids will learn to make a habit out of expressing gratitude too! Being thankful is very important as it has been shown to increase levels of hope, optimism and self-esteem in both children and adults. Hopefully making an effort to be more grateful over the holidays will allow your kids (and you) to be more thankful all year round. Here are some strategies to consider when teaching your kids to be grateful. With Christmas around the corner, it can be very tempting to save all your dollars to get your kids the latest toy or tech that their peers “must have.” Whilst you don’t want your kids to feel left out, it is also important they learn the value of money from the earliest age possible. If they genuinely have their hearts set on something, you could compromise by asking them to put their Christmas or pocket money towards it. This will encourage them to be more independent and appreciative toward you. Receiving a thankful text message or email is a nice experience, but it still seems sad that handwritten thank you notes and letter have become less popular. Receiving a thank you message that has been written by a child is truly heart-warming and should be encouraged. I personally encourage my kids to do so after birthdays and Christmas. But there’s nothing to stop them being written after other nice moments too, such as to thank a sports or classroom teacher who has gone that extra mile to help them. While it is oh so easy to reflect on what a bad day you’ve had, instead try to think of three to five nice things that happened when you look back on your day, no matter how small, and share these with your kids. Then ask them to share the nice things that happened to them during the day. This positive vibe will create a thankful and relaxing environment in time for a good night’s sleep. You can also record your family’s positive events in a blessings book. When any of you are feeling low, you can re-read old entries in the book with your kids to reinforce gratitude in your family. If your kids could go back in time, even 40 years, they would be shocked at how much we take modern technology for granted. Take a moment to stop and think about the luxuries around you in your home: your cell phone, computer, freezer and washing-machine for instance. Talk to your kids (in a lighthearted way, so it doesn’t sound too much like a lecture) about how these items make life so much more convenient and are actually more affordable than they used to be, even in these tougher economic times. Games can be a great way to teach your kids to be thankful, while getting the whole family involved! At Thanksgiving, place a pen and sheet of paper at each place setting. Then have each person write down something they are thankful for about the person seated to their left. You could even rotate these sheets of paper around so everyone has a chance to say what they are thankful for about everyone at the table. An alternative version would be for members of the party to take turns sitting in a chair while everyone else says why they are thankful for them. A thankful tree is also a great idea for year-round gratitude. 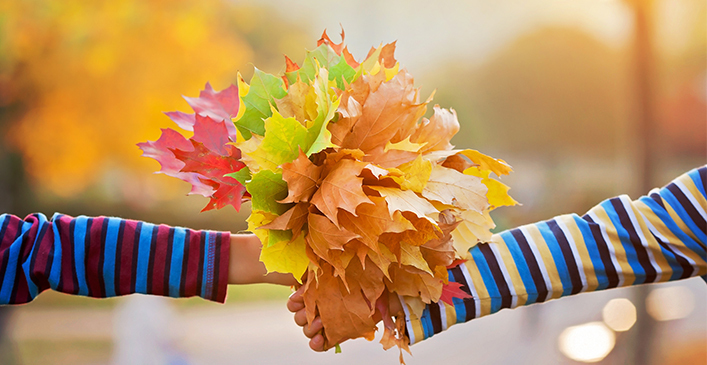 Place some small branches in a pretty planter and encourage your kids to write something they are thankful for about their siblings or family members on a leaf to be affixed to the tree. A similar idea that praised achievements was adopted in my son’s school, and it is a lovely way to see children’s confidence flourish as they realize in what ways they are appreciated by those around them. You’ll find your kids will naturally be more thankful every time they walk past the tree and read the leaves.